As a result, visionary filmmakers have often become known for extensive utilization of much longer takes, often containing intricate camera movements and exquisite timing. After all, how can you admire the mise-en-scene of a shot if it only stays on the screen for one second? Furthermore, a long tracking shot featuring either Steadicam or dolly movements, can become one of the most powerful and dynamic tools in a visionary filmmaker’s arsenal. A true visionary can often go from a high angle long shot to a closeup without the use of editing or zooming. However, in the wrong hands, long tracking shots can turn out self-indulgent and over-stylized, taking the viewers completely out of the film with their self-conscious artificiality. 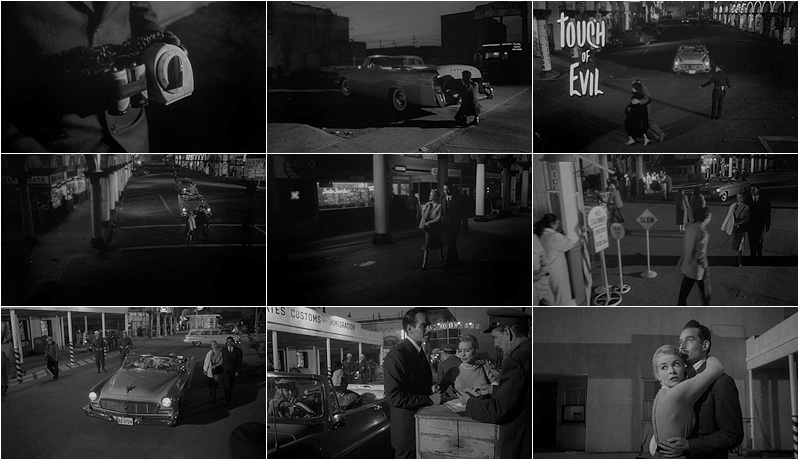 One of the most famous long tracking shots in cinematic history can be found in the opening sequence from the 1958 film TOUCH OF EVIL, directed by the great Orson Welles. This incredible one-take crane shot begins at a low angle as the camera follows a shadowy character as he hurries to place a bomb in the trunk of a convertible. We do not even realize that the camera is on a crane until it moves upwards to look down upon the convertible as it drives away. The change in perspective adds to the tension as we now begin to await the seemingly inevitable explosion. As the camera continues to move along with the convertible, we see are introduced to this border town and and also the protagonist Vargas (Charlton Heston) and his wife (Janet Leigh). The tension continues to mount as Heston and Leigh walk virtually alongside the convertible for much of the scene. Another more modern example of a very long tracking shot can be found in the 1990 film GOODFELLAS, directed by Martin Scorsese. This incredibly long Steadicam shot uses continuous fluidity to seamlessly show how Henry Hill (Ray Liotta) brings his then-girlfrield Karen into his world. With all of the characters and obstacles that had to be timed perfectly for this scene, especially the table at the end, the degree of difficulty in conceiving of and then flawlessly executing such a scene is astronomical. Some other outstanding examples can be found in the opening sequence from Paul Thomas Anderson’s 1997 film BOOGIE NIGHTS and the classic fight scene from Park Chan-Wook’s 2003 film OLDBOY. The Boogie Nights sequence is kind of a combination of the Touch of Evil and GoodFellas scenes, smoothly introducing each of the characters with a gliding camera. The Oldboy scene, on the other hand, uses the long take to make the fight scene feel more grueling, taking away the video game elements that are brought in by the rapid-fire style of directors like Tony Scott to make the violence feel more painful. What do these four scenes have in common? They were each directed by a true visionary filmmaker. Nice work, Hak. Well-done, long tracking shots are pure eye candy for cinephiles. PT Anderson is great at that. Off the top of my head, I’m also remembering he sat on Mark Wahlburg’s face for almost a full minute in the Sister Christian/Jesse’s Girl scene, a particularly brave shot. And that amazing tracking shot during the oil eruption in There Will Be Blood. totally agreed re PT anderson, haksnider. Kill Bill, Children of Men, The Player, I Am Cuba, Weekend, and The Shining – from autuers, all. A great fight scene was in The Protector, the Tony Jaa movie.